. . .Johnson. Ordinarily he would have been laid up in Papeete until after the equinox, but the company had sent for him to make a special trip to Penrhyn. We had a wretched passage north—a succession of squalls and broiling calms. The schooner was in bad shape, anyway: rotten sails, rigging falling to pieces, and six inches of grass on her bottom. On a hot day she had a bouquet all her own—the sun distilled from her a blend of cockroaches and mildewed copra that didn't smell like a rose garden. On the thirtieth day the skipper told me we were two hundred miles from Penrhyn and so close to Mataora that we might sight the palm tops. I'd heard a lot about the place (it has an English name on the chart)—how isolated it was, what a pleasant crowd the natives were, and how it was the best place in the Pacific to see old-fashioned island life. One of the treasures of post WWI western literature. 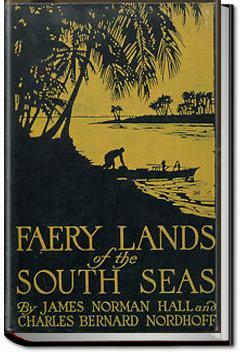 Only "In the South Seas" by Stevenson and a few others are in the same league.